As mentioned some times ago, whenever I am looking for a subject to post, the easiest way is to go to Codeforces.com and simply take a problem from the second division. If I manage to solve it from the first time, I write that it was an interesting problem and if I have to make 3-4 submits, I usually write that it is more than interesting. The idea was to guess the last digit of 1378, put on the power of an input, up to 10^9. As you probably see, this is something really big, thus it would be slow. 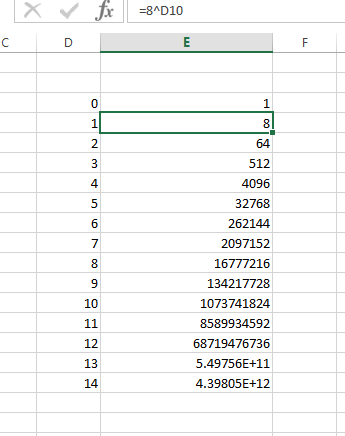 That’s why I built something like this in excel, just to see how the last digits of 8 change, when we increase the power. Pretty much, we have 5 cases – when the input is 0, and one for division with remainder 0, 1, 2 and 3. Thus the code was written without debugging and simply submitted.